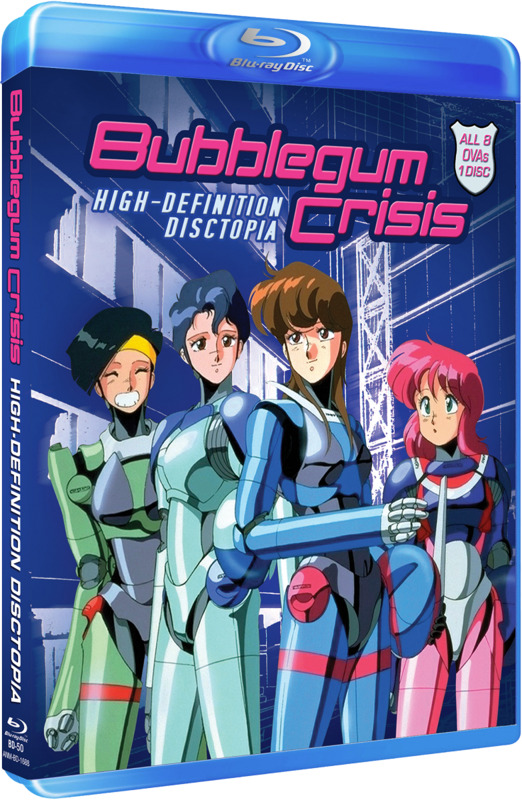 Bubblegum Crisis contains all 8 OVA's on 1 High Definition Blu-ray disc. This a great older series but it really makes me glad that I got the kickstarter edition which is on 3 discs instead of 1 like this release. Like a lot of people I'd be concerned about picture quality as a result of cramming all the episodes onto 1 bluray. But still it's a great opportunity for those who missed the ks release to get the series on bluray. One of my very first Anime experiences, and one I still re-watch from time to time. Great music and action with some serious ties to blade runner. I really loved this anime when it first came out. If you haven't seen this one, then you should. I was really glad to hear that got a blu-ray release and couldn't wait to get my hands on it. a really slick cover that pays homage to the original release box cover.